In countries that have discarded the outdated farce of prohibition, legalization and regulation bring with them high standards of quality control. If you are lucky enough to live in one of these enlightened locations, marijuana purchased in legal establishments is guaranteed to be unpolluted and of the highest quality. Prohibition, on the other hand, can open the door to unscrupulous traffickers who may employ devious methods to make more money from unwary buyers. Unfortunately, most of the world still bends to the yoke of prohibition, which can lead to contaminated weed. Being able to spot contaminated weed can prevent you from being ripped off and from putting your health at risk. • Adding cutting agents: Cannabis that has been adulterated to increase sale weight is often called “grit weed”. Fine-ground glass, silica, fine sand, or sugar are sprayed onto the buds. This has the effect of making the trichomes look denser to the untrained eye and adding more weight. • Faking quality: In order to make schwag seem like popular stinky strains, illegal weed may be sprayed with skunk spray, diesel fuel, or perfume. Buds may also be stored in a container with fruit peels or cheese to imitate the latest trendy strains. There are reports of some dealers dusting buds with dry laundry detergent to make them seem to produce a lot of kief. • Hazardous gimmickry: What's even more dangerous for your health is low-quality weed that looks okay, but may have been sprayed with harder drugs to imitate greater quality. Liquid crystal meth solutions, cocaine, and heroin have been added to poor-quality buds to enhance their effect. This can cause unwanted or even debilitating side effects. 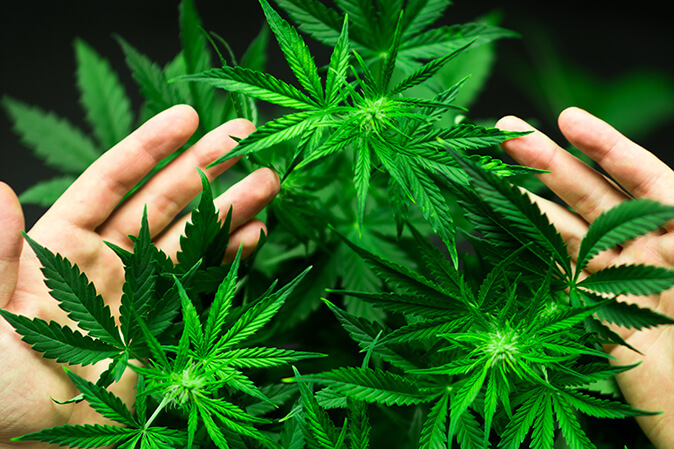 • Poor growing practices: Failing to flush weed properly in the final stages of flowering, especially with soil-free grows, leaves residues of growing nutrients and other additives behind in the finished buds. This leads to a harsh smoking experience with an alteration of desired flavours. Growth stimulants used to increase final yields, pest sprays, mould treatments, and foliage feeding residues can also remain on finished buds. High-quality organic weed will have nothing sprayed on it at least in the final three weeks of flowering. It will also have been flushed with clean water for at least a week prior to harvest. Aroma and taste will be pure and the smoke will be smooth. If you are suspicious of your supplier, remove a bud from the bag and inspect it closely. Use a magnifying glass to identify large misshapen crystals, especially along the stem. 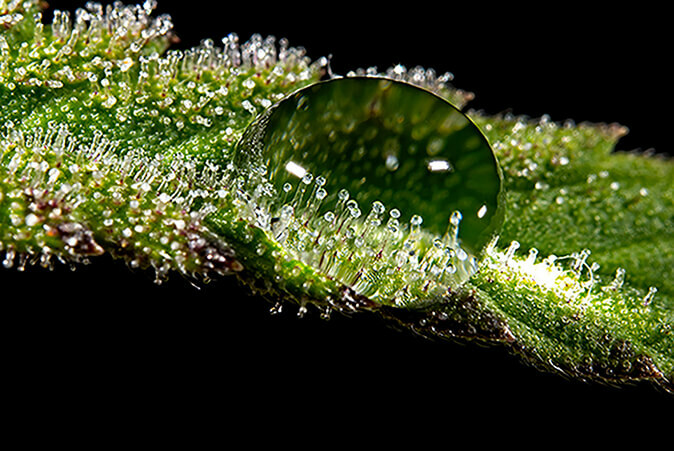 Trichomes remain spherical when dry and the glandular stem can be seen protruding from the trichome, attaching it to the bud. Foreign crystals like ground glass, sugar, or silica have a geometric shape. Glass and sugar are tiny cubes while silica is a longer filament. Neither will be genuinely attached to the plant material at all. Alternatively, grind up a small sample to make some powdery kief. Rub it between your fingers. Genuine cannabis resin will warm quickly and become sticky. Undesired additives will be perceptibly grainy and grind against each other and your fingertips. Using the same sample of kief, rub it on an old CD. True resin will smear, while adulterated weed will scratch the surface of the CD. Or, put the kief on a smooth surface and roll a glass bottle over it. The glass, sugar, or silica will produce distinct scratching and crunching sounds. Nutrient and spray residues are nearly impossible to detect. You won’t know until you have a go. Leftover nutrients in improperly flushed weed give a harsh smoke or vape, as do lingering pesticides or fungicides, which can be very dangerous to your health. The taste is not pure and the natural flavoursome aftertaste of cannabis is spoiled by a chemical-like undertone. Detecting other drugs is also difficult. When they are sprayed on as a solution, they soak into the plant material. Unfortunately, by the time you have figured out that you are high in an unfamiliar way, it is too late. Perfumes, fuels, and other aroma-enhancing deceptions really require an experienced nose to detect. Have a few really good sniffs. It should smell obviously organic. Some strains have a fuel and powerful lemon cleaner smell, but all cannabis shares notes that make it distinctly cannabis. There is a difference between “smelling kind of like diesel” and actually smelling like diesel. Aroma enhancers will be quite obvious when you spark up. They burn dirty and pollute the taste of the smoke. Cannabis tastes wholesome and not offensive. If the smoke has a strange colour or gives your throat a razor blade sensation, proceed with caution. Ash quality can also be a giveaway of pollutants. Dark ash that clumps together when tapped from a spliff should be viewed with suspicion. Discussing adulterated weed might seem bizarre to people living in states or countries where cannabis is legal, but until prohibition is repealed all over the world, those who need to rely on the black market will need to keep an eye out for contaminated weed.